The first signs of the cicada invasion are found in North Carolina. WXII's Ericka Miller reports. 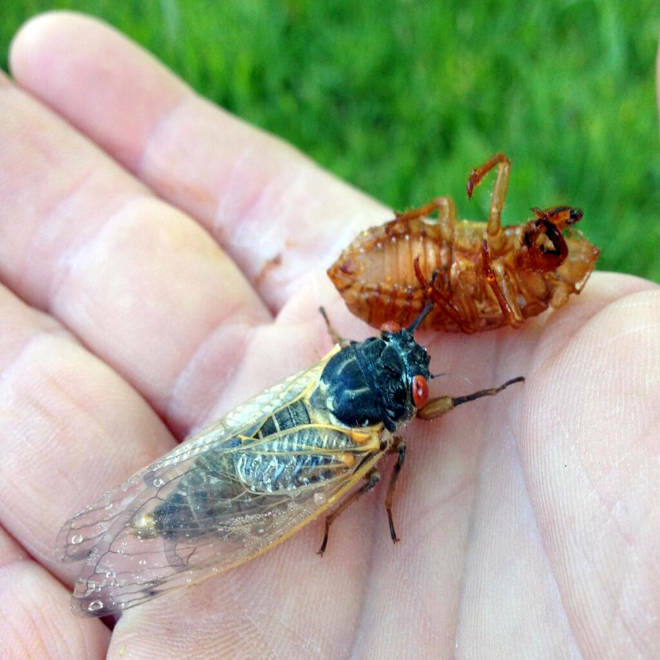 People are getting all twitchy about the bugs that are coming out in New York and New Jersey after a 17-year buildup, but when it comes to cicadas, Billy Tesh is seeing the real deal in North Carolina. "I was so excited," Tesh told NBC News from Greensboro, where he runs a company called Pest Management Systems. "I've never seen so many in one location in my life. They were on almost every blade of grass." And this is just the start: Billions of the insects are due to come out over the next few weeks, across a swath of the East Coast ranging from North Carolina to Connecticut. These particular cicadas have been biding their time underground since the Clinton administration, in 1996. For 17 years, they've been sucking up fluid from plant roots and waiting for their biological alarm clock to ring. The bugs emerge in droves when the soil temperature reaches 64 degrees. Other species of cicadas break out from the ground every year, but scientists suspect that the 17-year cicadas (and their 13-year kin) adopted a longer life cycle as an evolutionary ploy to overwhelm their predators with sheer numbers and surprise. When the time comes, masses of insects burrow out of their underground homes, shake off the shells of their childhood, unfurl their wings and look around for mates. This spring's group is known as Brood II — which comes between last year's Brood I in Appalachia and next year's Brood III in the Midwest. Tesh knows all about the broods: The 53-year-old pest-control specialist has been through several invasions by the red-eyed, loud-humming bugs. Even by his standards, this year's group of cicadas is special. He realized that on Thursday morning when he stopped by a farm in Stokes County, which appears to be one of the first places to experience the full force of this spring's "Swarmageddon." "This particular brood is extremely large," Tesh said. He's expecting the cicadas to take noisy wing in the next day or two. "They're probably singing tonight." A cicada and its shell sit on pest-control specialist Billy Tesh's hand during a visit to a farm in Stokes County, North Carolina. Red-eyed adult cicadas clump together in a tree in North Carolina. Hundreds of cicadas and their shells hang from dewy spears of grass in North Carolina. Cicada nymphs make their way along a path on Staten Island. Judging by the reports posted on Magicicada.org and Radiolab's Cicada Tracker, lots more cicadas have been emerging over the past week or so. Sightings have been reported not only in North Carolina, but in areas as far north as New Jersey and Staten Island in New York, which are traditional stomping grounds for Brood II. 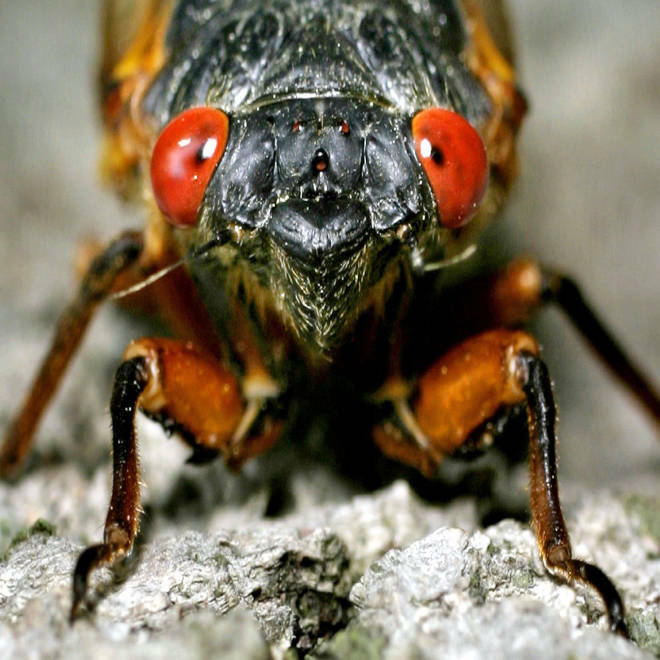 Those sightings are generating lots of buzz, but University of Connecticut cicada researcher John Cooley says the bugs in the New York metro area appear to be early risers forced out of their holes by wet weather. Cooley checked out the cicadas that were emerging at New Jersey's Cora Hartshorn Arboretum. "There are nymphs there, and there are lots of them, but I don't think they are ready to come out," he told NBC News. He doesn't expect these early arrivals to do well, and he thinks the nymphs spotted on Staten Island will be in a similar fix. The weather in the Northeast just isn't spring-like enough yet for full-scale Swarmageddon. Tesh says people have nothing to fear from the cicada invasion. The insects may damage some of the plants that they crowd onto, but they also serve to aerate and fertilize the soil. He's already gotten several calls from concerned customers in the Greensboro area — but so far, no one has asked him to bring out the pesticides. Instead, everyone has been taking his advice: "Just let Mother Nature take its course." Take a closer look at the curious 17-year life of the flying bug as the East Coast experiences an invasion. Show us your cicada photos by adding #NBCNewsPics to your tweet or Instagram post, or upload your pictures directly by clicking on this box.